The combination paid/volunteer department operates out of a single station and protects over 10,000 citizens of Montgomery, OH. Founded in 1795, Montgomery is a primarily residential suburb of Cincinnati. The fire department was organized in October,1993. Prior to that time fire protection was provided by a private organization - the Montgomery Community Fire Company (MCFC). 08/09 - Montgomery takes delivery of their second Spartan / Summit pumper for Engine 73. The 1989 Seagrave previously assigned to E73 has been retired. 05/09 - Montgomery receives a new 2009 Ford / Horton ALS ambulance for Medic 273. 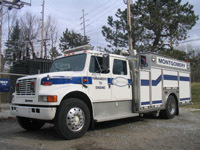 01/06 - Montgomery takes delivery of a 2005 Spartan / Summit rescue pumper, and Paramedic Engine 73 is retired. 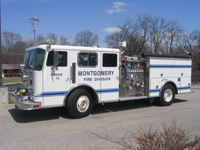 The apparatus used prior to 1993 were from the Montgomery Community Fire Company and can be viewed here.